Note: All cards NM unless otherwise noted. Wow, what a week! Between the Dragons of Tarkir reveals and the Magic Origins and Battle for Zendikar reveals, there are a lot of fresh specs in play. 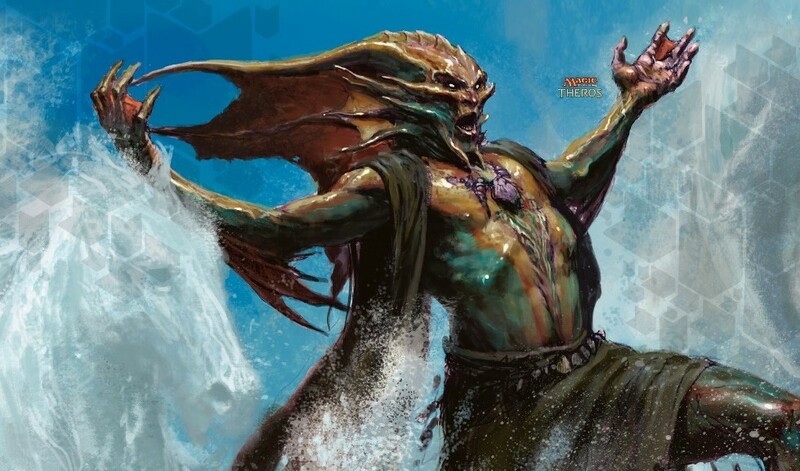 With the new UUU Shorecrasher Elemental revealed in Dragons of Tarkir, Thassa and Master of Waves both have a chance at seeing fresh play in standard, but I was already acquiring both cards on the assumption that they will find fresh homes in Modern/Legacy eventually or simply age well as casual specs. Either way, they are undervalued mythics and I’m going deep. As of this morning, they’ve both spiked 40-70% off the reveal of Shorecrasher Elemental, so we’ll see if a deck emerges with legs. Some of my copies were bought around $2-3, so I’ll be looking to out them immediately. Otujai Exemplars was a value play, since I snagged it well below the average pre-order price. I think this card settles in the $6-8 range, assuming some standard play at top tables, but could rise later if it fits into a winning deck and supply has dwindled. I’ll likely trade out early and buy back in when enough packs are cracked to see a new low. Ashiok, Nightmare Weaver featured prominently in the winning deck at the first SCG Modern Series last weekend in the hands of Sultai master Gerrard Fabiano. He’s not a staple in the format yet, but any chance of this mythic planeswalker seeing continued play in Modern makes me willing to pick up foil copies at market price. Interestingly, the only Japanese copies I could find ended up being from Travis, who got in on them at $30 and is happy to nearly double up and move on to something else. Decimate is a Conspiracy foil that is selling for 1/3 of the original foil. That gap will close, especially with more Conspiracy hoarded in sealed boxes than actually opened. It’s a great EDH/Commander card and should top $10 within a year or two. The LoTV was a copy I found at an LGS that hadn’t boosted prices yet from her recent spike/US to CDN currency exchange. Abrupt Decay is a card we should all be acquiring in quantity. It will hit $20 within the year. Sliver Hive is a highly specialized piece of real estate with huge casual demand, occasional Tier 2 Legacy play and a low chance of imminent reprint. As such I’m targeting an $8-10 price tag within 18 months and have been acquiring them in quantity since release. As for Tasigur, my early call that he was underrated has come true, and I now expect this guy to be a multi-format player for many years. As such, his small set foils are pretty tasty at any price under $30 and I’ll aim to acquire plenty over the next few months. On the sales side, I’m generally stock piling more than selling, but I cleaned out a few randoms this week, and I’m ramping up to out my Tasigur piles up 300% to move in on foils. “I bought End Hostilities due to the reveal of Ojutai’s Command and Narset Transcendent. U/W Control is getting good support from Dragons of Tarkir and End Hostilities will fit in the deck nicely. I picked up the clash pick Whip of Erebos because I think its a nice long term hold for Commander. Whip gives a powerful effect to black decks and I like the art on the clash pack foils. It adds another layer of collectability to the card. Scourge of Valkas: Spreading out my Dragon holdings in anticipation of DTK increasing interest in the entire tribe. Scourge of the Throne: Dragons and dragon-related cards have been spiking a lot recently with Dragons of Tarkir on the horizon, and Scourge is well positioned. It’s been creeping up for awhile, and Conspiracy was not opened much. When I bought in I was intending to wait anywhere from a month or two to a year, depending on how long the demand took to squeeze the market. Turns out I was only a few hours ahead of the wave as we’ve already seen a good spike on Scourge this week! See the Unwritten: Something will be battling against our heroes for Zendikar in the fall, and it’s a pretty safe bet they’re the Eldrazi. Who doesn’t want to dump the new Emrakul and Ulamog into play with this? At a little over $1 each, the card doesn’t even have to be good. People just have to think it will be in order to make a profit here. Battlefield Thaumaturge: I’ve liked this card since it was spoiled, but never bought in. With Assault of Dragons in DTK, alongside another red token maker, you can kill your opponent turn four with a sequence of Dragon Tempest, Hordeling Outburst, Thamaturge and Assault. At $.25 the risk is very low and the price potential is in the double digits if the deck breaks out. Sage of Hours: I talked about this card in my article on Wednesday. Hall of Trimpuh: Glorious Anthem effects have always been popular, as noted by the >$1 price tag on the eponymous card despite six printings. A colorless anthem from a small spring set stands to be at least $1-$2, and possibly $3-$6. Chord of Calling: Chord used to be a $40 card. It’s fallen out of favor somewhat lately, but with Birthing Pod gone, it is the best creature tutor in Modern. With the card at a lifetime floor, now seems as good a time as any to stock up for what could be a $7-$15 card in a year or two. Note: Guo Heng Chin buys from Malyasia, so his costs will tend to be different than for those of us based in the west. “Both transactions were conducted during FNM at my local game store. The foil Hypnotic Siren was for Tiny Leaders. It was a discovery by a friend and fellow Magic player, @rezaaba. A couple of weeks back he mentioned to me that Hypnotic Siren is one of the rare few control magic effects legal in Tiny Leaders. I stumbled upon a foil copy at my local game store yesterday while sifting through a collection they have just bought. I’m not sure how viable Hypnotic Siren is, but she provides a rare effect in the format and has a Nyx-ified border, which means a very low chance of reprint. I’ve started offloading the 16 Outpost Sieges I bought at $0.49 apiece last month. Outpost Sieges are currently retailing for $4 – $4.50 and while I’m fine with selling them at $3 – $3.50, I have a nagging feeling Outpost Siege still have room to grow. Outpost Siege is pretty insane in Standard and Caleb Durward suggested that it may even be good enough for Modern in his article last week aptly titled ‘The Best Cards Not Being Played in Modern’. Hey guys. I can assure you that none of us have any reason to report anything but the facts. These articles aren’t about impressing you with our prowess in locating great prices, but to provide you with some context for our other articles and arm you with tools that may allow you to find similar deals locally and ride a trend or two to profit. Speaking for myself, I have a solid network of vendors and collectors to source deals from, the Canadian exchange is definitely helping me on local deals (the rest of the guys are either in the US or Asia), and I tend to move fast as prices are moving. That being said, my quoted purchases are always converted to USD. Hope that clarifies. Happy hunting! Forty-one of them were actually under $4 each. I’m well aware that that’s cheaper than what has been the going rate on TCG for some time. I bought a handful at around $7 or $8, and the rest at the reduced rate from a particular source. It was not a matter of some amazing Magic-buying prowess, rather having looked in the right spot at the right time. I think a lot of people assume that TCGPlayer = the market when in fact it’s a tiny subsection of the market. eBay alone does far more volume. Who cares? You want them to provide receipts? I read these articles to learn something and maybe help my finances. If it’s just good to be “writers” stroking their egos and lying about prices they paid to make themselves look smarter, then what’s the point? They’re telling the truth. They’re buying them from Canadian vendors, which are essentially 20% off, due to the dollar exchange. Ah yeah, Travis is such a liar. Oh, I am too because I was able to find, for example, Sage, Chord, and See the Unwritten online for less than he paid without too much effort. And this was within the last 15 minutes. Hell, three days ago I bought a few Outpost Siege at $1.49 because my LGS hadn’t updated their pricing yet. Now they’re at $4.49 which comes closer to matching the market than $1.49 does. Its a blast to doubt someone’s integrity without proof isn’t it? Wow, I’m actually a little shocked some are doubting the purchases here. They can be made in a million ways. Whenever I hit up an LGS I always bring cash because with money in hand people will often sell for a little less than deal with the hassle of moving stuff online. I’ve managed to get many cards below value in this way. I’ve also sold cards in this way as well. Losing a bit of profit is fine if it means I don’t have to deal with ebay, tcg, the post office, etc. With that being said, thanks for posting these, guys. This site has helped me out a lot with the finance aspect. I’m certainly no expert, but I’ve managed to put together a pretty decent portfolio in the last year…keep it up! You guys do a great job. I apologize for any people who doubt or slander your integrity. Everything online is based on trust. Either we believe you, or carry on. Thanks for all the effort you guys put into each article. I wish there were more people like you. I purchased a foil Master of Waves this week for $3….. because I packed it. It counts. I wanted to have your opinion on one thing : how do you feel the market will react to the announcement of the Fall bloc, and a potential enemy Fetch reprint (pure speculation here but…)? Is it time to move the enemy fetches? Will the speculation bring them down, or not? Most of the downside of enemy fetchlands being reprinted has already been priced in to the SHORT TERM price. That being said, they will eventually be reprinted and the price will likely be in the $15 to $18 ballpark if the power level of the rest of the cards in the set mirrors Khans. In other words, if you are not using them just now and won’t in the next six months, sell them – there is almost zero upside to holding them. I haven’t made any moves lately. I can only hold onto what I’ve got and start moving as the profits are there to be had. I recently had a kid and so getting to FNM or just gaming in general is tough, but when I do, I have a lot of stuff I intend to trade off for long term value. Looking to start getting fetches primarily as there is little risk there. Although I don’t think anyone on MTGprice is lying about what they pick up or for what cost. I do find it to be a bit misleading. You are telling the truth but it kinda gives a false reality that these deal are possible all the time to anyone. When really its something you have to work hard at. You guys make it look easy when its far from. If you buy from the same sources as everyone else then you’ll get the same outcomes. You can absolutely find good deals, both locally and online. Seek out smaller stores, buy collections on craigslist etc. It’s called building relationships and making contacts. If you are buying, selling, trading or playing Magic you should be doing that already. Any “deals” you think they are getting are because they’ve put the work in to it. You can do the same thing instead of considering it to be misleading or a false reality or whatever you want to call it. But if you’re not willing to do so then don’t blame the MTGPrice guys for putting the work in by calling their efforts misleading. That’s on you. I will say that if you go in and act as a retailer, IE you’re just in there to buy, sell, trade and for your benefit only, then yeah, no one is going to try and trade with you. If, however, you come in, form good relationships by playing, talking with, offering deals on things you have made decent profit on and are willing to take small hits on compared to the actual retail of a card then people will remember that when you go back and trade again. I also think that people are forgetting that the MTGFinance guys treat this as a second job. That means they WORK to get deals to make profit. If you’re trying to make extra money you’re going to do whatever you can. I go by a smaller hobby store near me that doesn’t update their card price database but every month or two. That means if a card has spiked recently after their latest update they are likely to sell at an extreme discount. I go there and often times other players have done what I have, but sometimes not too.